The ongoing draw down of the Federal Reserve’s Quantitative Easing plan is in full swing, with another $10 billion slashed from the buyout budget every couple of months. 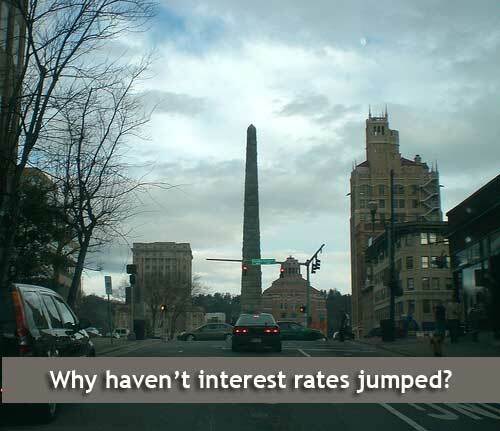 According to predictions, that should cause interest rates to jump. But despite the fading of the Fed’s artificial manipulation, those rates are hovering close to the historically low levels of a few years ago. And that may be good news for US consumers. Interest rates for the typical 30-year fixed rate home mortgage of the kind Jason Hartman recommends to income property investors are still hovering below 4.5 percent. That’s maybe not quite as low as those historic rates of a couple of years ago. But industry watchers had predicted a much bigger jump following Fed’s decision to scale back the stimulus. And scale back it has. Qualitative Easing 2, its plan to boost the economy by buying up billions of dollars worth of mortgage backed securities, was intended to push banks to keep rates low, thereby encouraging people to take out loans, which they’d then use to buy things, in a chain reaction that was supposed to benefit not just the struggling housing market but also the economy as a whole. Though critics worried that the stimulus was really only benefiting the banking industry, its impact was clear: rates stayed low and big ticket purchasing, primarily housing, went up. And that’s why news of its draw-down sent jitters through the financial world. The Fed is now on its third round of scaling back, paring another $10 billion off its budget every time – a move that triggered speculation that rats would bounce up as natural market forces took over. But halfway through 2014, that still hasn’t happened. According to a recent report from Interest.com, the reason for the continued low rates has little to do with the Federal Reserve, and much more to do with a dip in the numbers of people applying for mortgages or refinancing plans. Sante, Mike. “Interest Rates Fall to 2014 Lows Despite the Fed.” Interst.com Mortgages. Interest.com 4 Jun 2014. Accessed 21 Jun 2014.